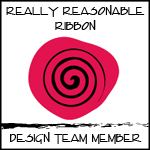 Hello blog friends, and thanks for stopping by today as I post for Really Reasonable Ribbon. 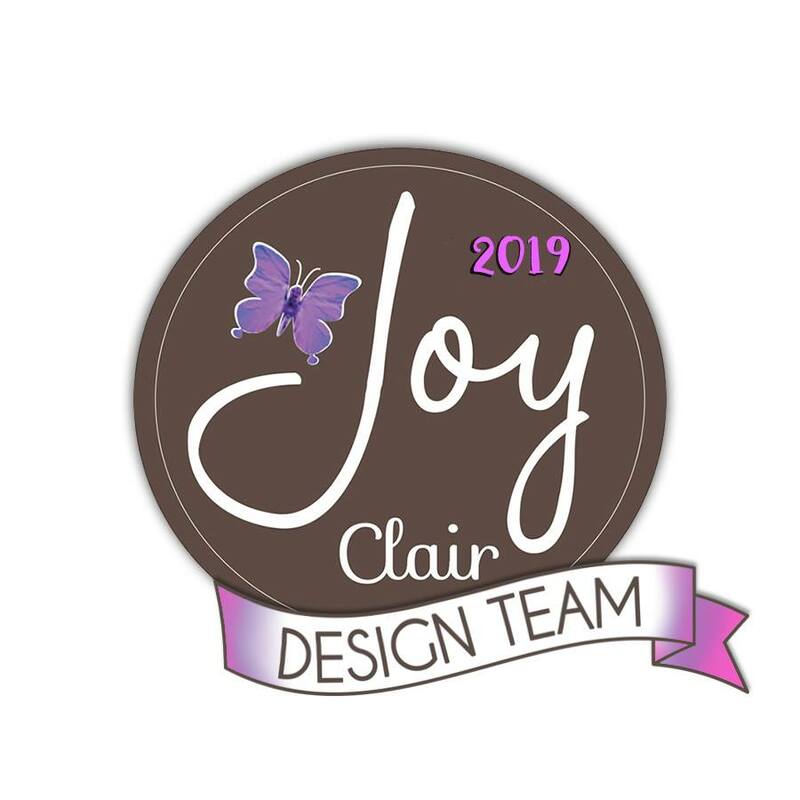 The card I'm sharing today was inspired by a similar card created by my talented teammate, Ginny, who shared back in February on her sweet blog, Polly's Paper Studio. Her card also used this chicken wire background (hers was wooden and mine is a die-cut), and some sweet little prills (along with lots of great products from Really Reasonable Ribbon, of course). The card she created that inspired mine was all done up in deep purples, but I chose to do mine in pink because, so far, I only have pink prills. This is another thing on my ever-growing list of crafty items to buy. 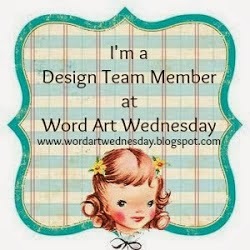 LOL If you click on Ginny's Blog link, you can see her sweet purple card that inspired me. Really Reasonable Ribbon helped my make mine uniquely beautiful. 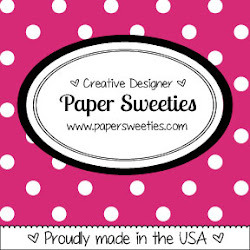 I started this card with a piece of soft muted pink polka dot patterned paper from Crate Paper. 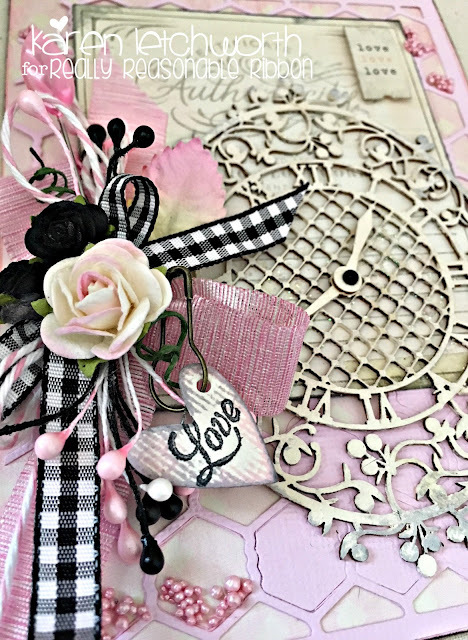 Next, I cut the chicken wire background from pink Bazzill using a die-cut, and placed that on top of the patterned paper. Carefully using clear craft glue and a tooth pick, I delicately attached my pink prills here and there on the chicken wire until I achieved my desired look. I found this cute vintage looking journalling card among my Crate Paper scraps, and chose to use it. I attached it with two strips of Scor-Tape. My next step was to use some ivory acrylic paint to cover the wooden clock and clock hands, and then I attached that by again using some clear craft glue. Once all that was in place.....the fun part began.....adding the Really Reasonable Ribbon touches. I started with a bow that I tied using a length of Textured Tow-Tone Pink Ribbon, and then I added some Baby Pink Double Head Stamens, a White Double Head Stamen, some Black Double Head Stamens, Cotton Candy Baker's Twine, and a piece of 3/8" Black & White Gingham Ribbon. I tucked in a sweet Small Green & White Paper Mulberry Leaf, and I topped it all with two 10mm Black Open End Roses and one Two-Tone Pink & Ivory Open End Rose. I also tucked in a pink leaf stick pin, a sticker sentiment (love love love) and hung a rusty pear-shaped safety pin that holds a small die-cut heart tag stamped with "Love". Everything is inked with Hickory Smoke and Spun Sugar Tim Holtz Distress Inks. 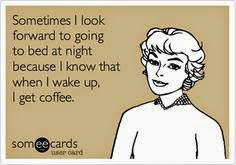 You know.....I realize that I say this all the time, but it's true! You can literally take any piece of paper (or papers) and add a few sweet ribbons, trims, flowers, etc. from Really Reasonable Ribbon....and the next thing you know....you have something wonderful. You really will LOVE their wonderful products. I just adore the way Really Reasonable Ribbon's products made this card look. And I know you will love your new products, too. So why not treat yourself today? Some Double Head Stamens, Baker's Twine, Flowers and Ribbons are just what you need. Check out everything now at Really Reasonable Ribbon. And have fun doing it! 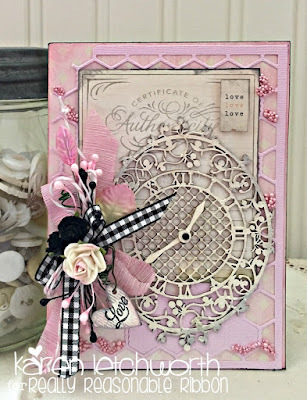 Simon Says Stamp Wednesday Challenge - Simon Says "Anything Goes"
Scrapy Land Challenge Blog - Challenge #86 - Anything Goes - I used a cute Chicken Wire Die-Cut by Cheery Lynn Dies on my card. Beautiful card, Karen. Love the clock piece. Swooning here, Karen, this is a lovely creation! 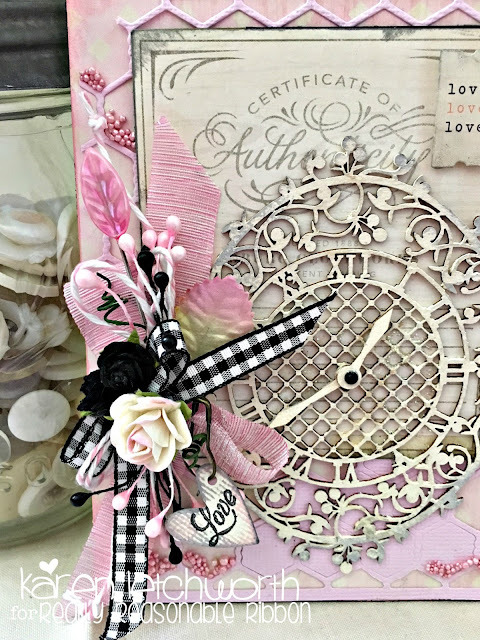 I can't seem to carry off shabby chic, but you do it perfectly - thanks for sharing this with us at the Simon Says Stamp Wednesday challenge! Karen this is so gorgeously done!! Such a beautiful orchestration of all the effects to a perfect culmination of this beautiful feminine card!! I saw that you are trying out for Simon Says Stamp DT and I think you are so fabulous and they would be lucky to have your wonderful work!! Good luck my friend! Wow Karen this is amazing - love your gorgeous work, and so beautifully put together. Those prills are stunning and add so much to the background. Simply striking with so many details, that are eye catching. Thanks for joining us at scrapyland-blog.com. I saw this on a challenge blog and HAD to stop by and say how much I loved it! This is stunning, Karen. You always inspire me so much with your art. I saw that you applied for the DT over at Simon Says Stamp. I really hope you make it on that team...you would be awesome at it and I'd love seeing your inspirations (like I always do..LOL). 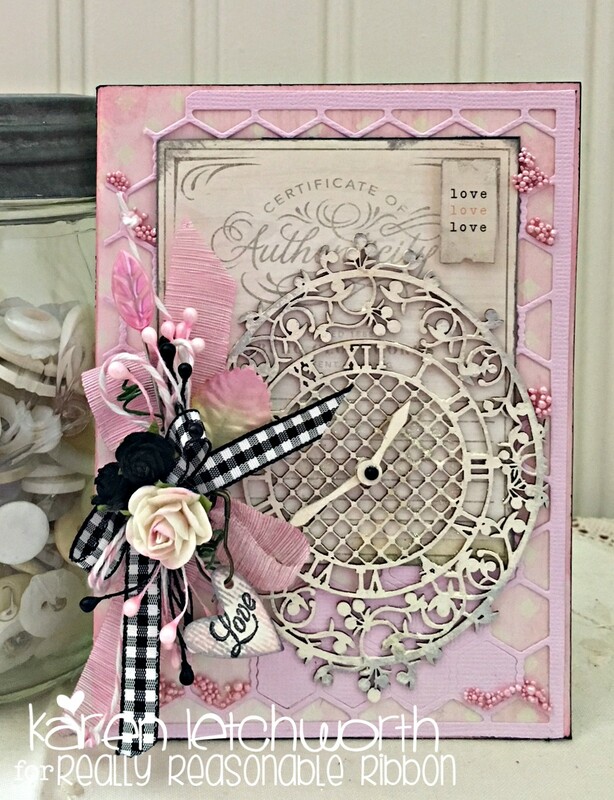 The wooden clock on this card is so cool. Hi Karen! What a gorgeous card! Love the pinks with the black and grey, and your "conglomeration" bow is amazingly lovely! I know I am very late, but I just had to tell you how beautiful this is! Hugs!